This CD celebrates not only the bicentenary of Charles Gounod’s birth but also the instrument the music was written for: the humble horn, which appears to be not so humble after all. Featured on this recording are works for both natural and piston horn by Charles Gounod, Auguste Mathieu Panseron, Marco Bordogni and Jacques-François Gallay, as well as an arrangement of Gounod’s À la nuit by François Brémond. All these pieces were composed or arranged to promote the virtues of the valve horn. They are performed on original period horns and accompanied by a grand piano. The 19th century was a fascinating and important era in the development of the horn and its repertoire. The horn’s evocative sound has always primarily been associated with the hunt, which features prominently in many stage compositions, such as Der Freischütz. The instrument’s development in the 19th century, and composers like Gounod (1818-1893) contributed to a new and more varied array of musical styles for which it could be employed, thus opening up a whole new sound universe which we take for granted nowadays. This recording makes us yet again aware of what should need no extra mention: the horn, still underrated as a solo instrument, is a worthy and intriguing instrument in its own right. How marvellous it is to combine praise for this instrument with the somewhat forgotten compositions for it, and, most noteworthy of all – not only because of the 200th anniversary of his birth in 2018 – Charles Gounod. 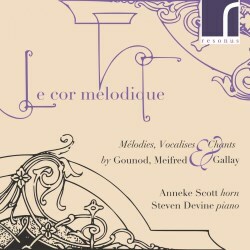 His Six Mélodies pour Cor et Piano are simply merveilleux. Naturally, most of the pieces for solo horn were intended for practice. Pierre-Joseph-Emile Meifred (1791-1867), for one, arranged many études for horn. Both the pieces by Panseron and Bordogni included in this present compilation were published in Meifred’s Méthode pour le Cor Chromatique ou à Pistons in 1840. This was the first comprehensive tutor for two-valve horns and was republished for three valve-horns nine years later. Likewise, Jacques-François Gallay (1795-1864) produced a large number of études for solo horn, albeit also composing for horn ensembles and adapting operatic works for horn. Anneke Scott studied at the Royal Academy of Music in London and specialised in period horn playing in France and the Netherlands. She is the principal horn of several internationally acclaimed period instrument ensembles. Scott is joined by the pianist Steven Devine, who plays in the Orchestra of the Age of Enlightenment and The Classical Opera Company, touring Europe extensively. So far, he has recorded 36 CDs as accompanist as well as solo artist. After listening to his performance on this recording, one knows why he is such an acclaimed pianist. Thankfully, Anneke Scott’s rendering is exemplary and thus ensures that the horn retains the leading role ascribed to it by the CD’s title without being overshadowed by the piano. The booklet, in English only, provides detailed accounts on the difference of the natural and valve horns and useful information about the composers. Unfortunately, the imprint on the CD itself is hardly legible, as it features a white font on a cream-coloured background. Even if this recording does not let us forget evocations of the hunt, it clearly shows the broad possibilities the valve horn offers as a solo instrument whilst retaining most of the enchanting and richly coloured sound of the natural horn - and above all, it is a worthy celebration of Gounod’s 200th birthday.